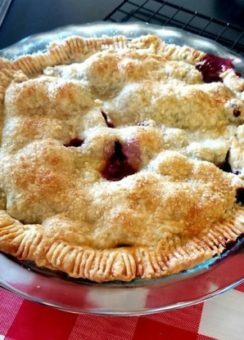 This Razzleberry Pie recipe, submitted by Anna Attia of Canoga Park, Calif., took second place in Coast Packing’s Second Annual #LardLovers Recipe Contest last December. The month-long contest drew homegrown recipes — savory and sweet alike — from around the country, as well as feedback from the social media community. 1. Mix flour, lard, salt with pastry blender. Put vinegar in milk. Add milk/vinegar to flour mixture. Don’t over mix. Shape two discs (one slightly larger than the other). Wrap each disc in plastic wrap and put in refrigerator. 1. Gently fold lemon juice, sugar, corn starch and all berries. 2. Roll larger disc and put in pie dish (I prefer glass). 3. Put berry mixture in prepared pie dish. 4. Roll smaller disc and cover pie with second disc. Crimp edges and cut 4 slits in center. Quickly use a pastry brush to cover pie with egg/water mixture to give a golden glow. Add turbinado sugar for extra glow. 5. Bake in oven for approximately 50 minutes. ENJOY!!! !